My dear friend Jessica is having a sweet girl in April. Ava's nursery is so pretty and I am going to be painting this for her sweet space. Also I will be out of town with the WHOLE kit and caboodle starting tomorrow---so I will not be blogging for a little under a week. Have a great one! 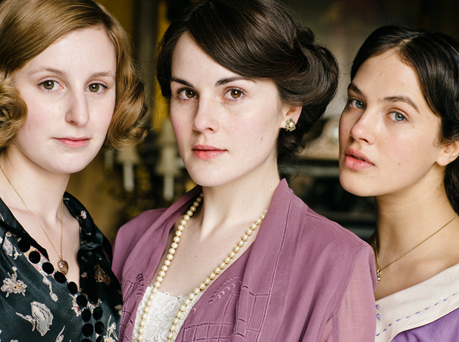 If you are like me, you have been swept away by the magic of Downton Abbey and are now in a sweet post Season 2 hangover. 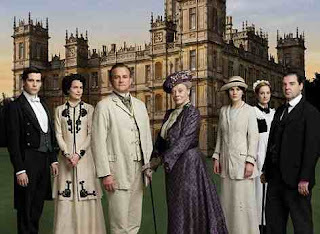 They say it will make its grand return in the fall, which makes me happy. In the meantime you can listen to the music and you can also buy Season 2 on DVD now. My friend Lia and her family moved to the Carolinas this past spring. From Miami they took with them their sweet daughter and apparently the intentions of having another baby! Last week Lia saw one of my paintings on Pinterest and asked if I would do something similar for her Sam. At first I was confused....but then I realized what this meant. Quickly after I said "Of course!" she sent me a picture of the quilt that will be in Sam's room. This is the initial sketch of Sam's nursery painting. It's very different from anything I've ever done for a boy---but just like the rest of his family, I have a feeling Sam is going to be a very fun and creative boy. Last night I was at the Junior League meeting and one of our transfers walked by, we'll call her CLG---as she did I said my fashion forward friend, I love what she has on! My friend said to me, "She's from Chicago"...and I said, "Yeah I know". So I have said it before, and I will say it again...I love to see what people wear and asking them where they got it, or sifting through my mental closet to piece a similar look with pieces I already own. Luckily...this is one case where I have all but one element of the look...and that one element were her shoes, which for the sake of this blog post I am changing to the ones I would have paired up...not that I didn't like hers...I really did, but I haven't been able to find them online. This pink scarf is currently online at Nordstroms online for $18. CLG had one similar to this on minus the fringe. Old Navy does it again with this find. 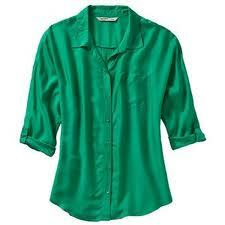 CLG had on an emerald shirt similar to this one. This one is online and on sale at Old Navy. 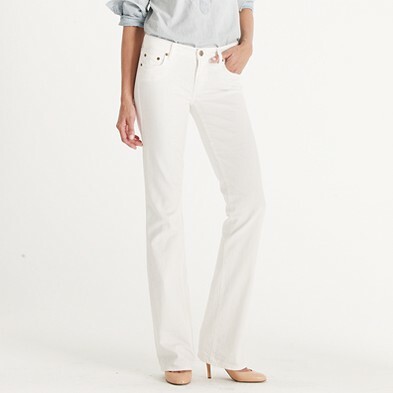 These jeans are perfect from J.Crew. These white skinny jeans are $98. CLG had on cuffed ones that were more clam digger in length. Finally the Minnetonka Moc. I love these...I've been obsessed with getting a pair since my week stay at Singleton in the Kitchen's house in DC a few summers ago. Last night CLG had on a similar pair, minus the beading in a cream color. Happy Wednesday! 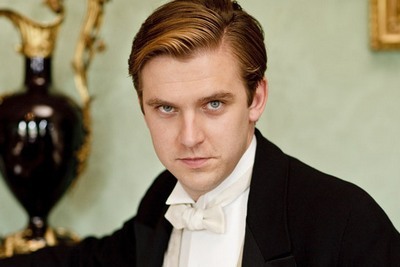 I hope you had a lovely Valentine's Day with people you love. I know I had a great burger and fries dinner just like I wanted :). Today is Wednesday though and here is my weekly sketch! Ready to go from breakfast meeting all the way to after Junior League meeting event tonight! 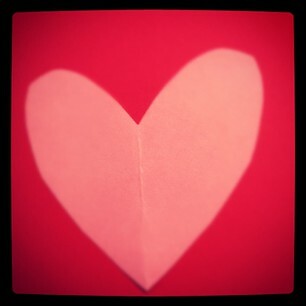 Happy Hugs and Kisses Day! May your day be full of chocolate, hugs, kisses and cocktails! I remember it, not crystal clear...but I remember it. I was 7 years old when her first album was released and I instantly liked the sound of it all. The poppy tunes, the catchy lyrics, the big bows in the hair and ruffled skirts in the videos. I wanted to get up and dance with Whitney every chance I could! My favorite was "How Will I Know" (which I use to sing about my 2nd grade crush...dramatic I know!) and "I Want to Dance with Somebody" (where in my mind I empathised with Whit because I TOO wanted to dance with somebody in the 2nd grade). As I got older Whitney still had it and I continued to be a fan of her music with songs like "I'm Your Baby Tonight" and "Heartbreak Hotel". There is no denying that she was gifted, and her voice was that of record breaking status. 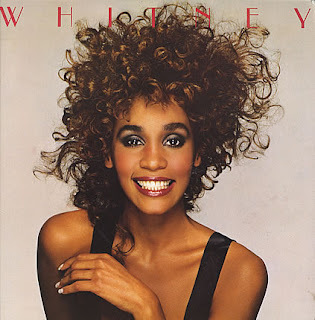 Even when things started to get weird (thanks Bobby) she was still Whitney. SNL did a great job with Maya Rudolph as Whitney and she herself was a parody of herself on her reality show. So thank you Whitney. Thanks for being a part of my childhood memories, and my laughs as an adult. Your music will live on forever. Happy Friday! Last night I used my iPad for art creation again....and here it is. I found a particular stroke which allows me to create just the right barely there lines for an ikat pattern. I want pants like this--- but I also really want to put a monogram on this! Anyhow--- have a wonderful weekend! February is turning out to be a very busy month for me (socially)...which is fun! I'm throwing a dear friends baby shower next Saturday and later this month I am going to one of my cousins weddings in Nicaragua, where all weddings in our circle call for Black Tie to the max! I mean...it's like the Oscars red carpet. So this weekend I am on a mission to find the right dresses for both of these occasions. I have already started doing some homework and this is what I have found. This top dress I found at Bloomingdale's. It's a designed by Tadashi and absolutely stunning. It's elegant and makes a statement all while being age appropriate for lil'ole me. Isn't it stunning? $400+ for this stunner! 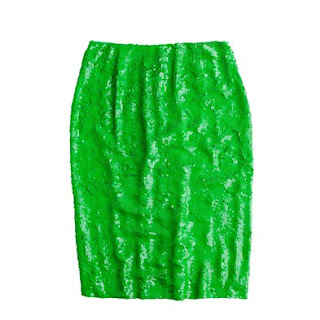 This dress may be familiar to you. 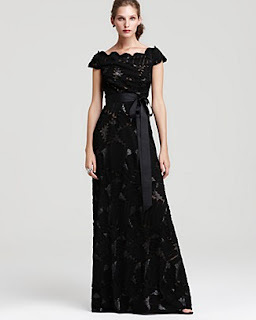 It's one of Jason Wu's designs for his limited edition line at Target. The best part about this dress (other than the price tag)...is that it has POCKETS! 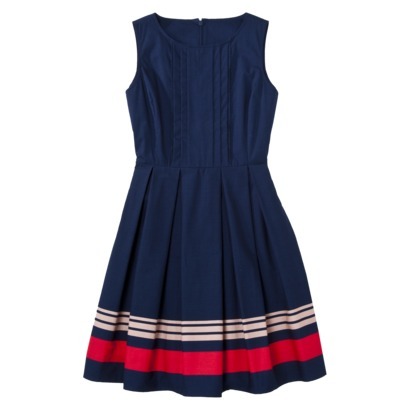 Who doesn't love a dress with pockets? 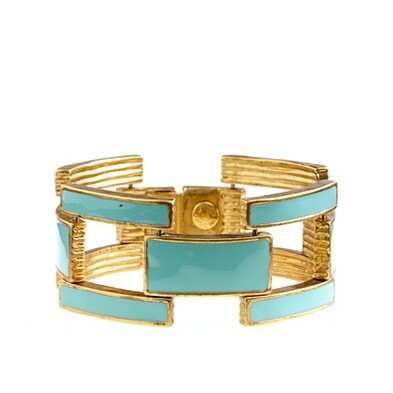 I figured I can wear this with my new Tory Burch red Reva flats and pearls. Perfect for not only a baby shower, but Sunday church, brunch...etc. I am taking suggestions! If you have seen anything out there (especially for this wedding) please let me know! I'm on the hunt!! Happy Wednesday! I have to say I love it when people compliment what I am wearing, especially when I tell them where I got something and their jaws drop---i.e. you don't have to spend a million to look like a million. Anyhow---today I've got a pop of orange going. Not an ordinary shade of orange...but somewhere hovering in between traffic cone and fireball! Also--- have you heard of Stylitics? It's a website where you catalogue your wardrobe and can log when you wore what...its suppose to be a good way to see often you were certain outfits and colors. Sounds cool...I started building my "closet" but I have to tell you...they say the avg. # of items a member has in their closet is 20...that's just the amount of Tory Burch flats I have! ...if you want to try it click here and ask to be in the beta. In theory it's cool----in practice it seems time consuming. I love Ikat. I think it's such a fun and sophisticated print. The colors can be electric or muted but overall they work together and create an elaborate system that looks beautiful. Over the past few months I have been meaning to do an ikat watercolor, but alas still have not found the time to do it. Fortunately yesterday I had my iPad with me while at the DMV for 3 hours (it's a sad, stupid and silly story that got me there)... and so I created this. I first heard Bombay Bicycle Club's Shuffle a couple of months ago---but recently I realize how much I like it when it comes on. I also have noticed how much my wee one likes to bob to this song. So after a long, hard and irksome say...this tune picked me up! 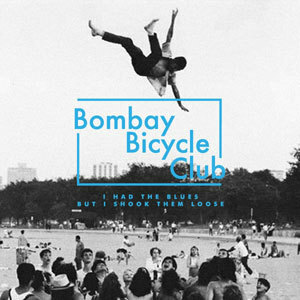 Click here to see and hear Bombay Bicycle Club's Shuffle. Oh how they have done it again! J.Crew's Spring 2012 collection has taken my breath away...and could also easily walk away with my entire bank account if they tried! I confess that I did spend my birthday money on two of these items and the pave link bracelet that I've been coveting. I'm actually wearing it today. So here are some of my favorites from their Spring 2012 collection. This stunning sequin skirt also comes in a gorgeous pink...but there is something organically beautiful about the green. It is pricey at $695.00...but it's smashing! This striped bracelet is such fun for stacking. I think the colors scream for spring garden parties! It's only $42.00 so easily can be integrated into your collection of baubles. 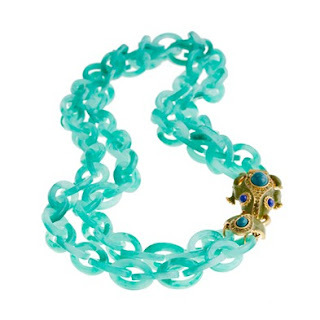 This is yet another beautiful bracelet to stack this spring. You may be seeing a trend with me in the choice of colors. 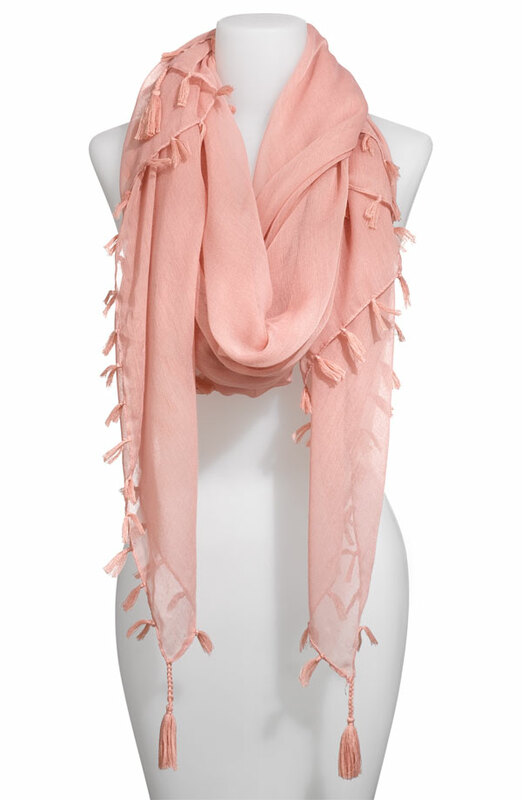 This beauty is $60.00 and can be dressed up or down quite easily. 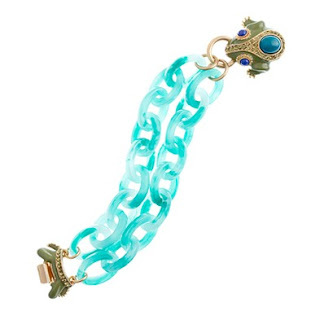 The frog clasp necklace is the bracelet's partner in crime. Normally I wouldn't wear the matching set of it...BUT I am stacking my bracelet with the pave today. As I said, this necklace is MUCH lighter than the 2007 version. It's honestly something I know I will treasure forever. Knowing how amazing J.Crew's quality is, I can say that the $128.00 investment in this necklace is worth it if you are looking for a statement necklace to have in perpetuity. This shot is what first attracted me to the bracelet. I saw it on Pinterest and fell in LOVE with this look. As you can see the blue and greens combined with the right doses of gold are spectacular! Anything catch your eye so far this spring? I always get so many compliments on this necklace when I wear it...so I always have to thank my dear friend Ben who gave it to me for Christmas/ birthday in 2005. It's one of my favorites!